New Zealand’s slide down the OECD rankings in terms of per capita GDP is relatively well known. Also well known is a variety of anecdotal reasons why this is happening, and even more on what should be done. Surprisingly little robust analysis seems to be available on the matter. Where statistics are quoted they often seem to be misused to reflect the personal predilections of the commentator rather than necessarily being compelling statistics in isolation. Figure 1 above shows the decline in New Zealand’s relative performance since 1980. 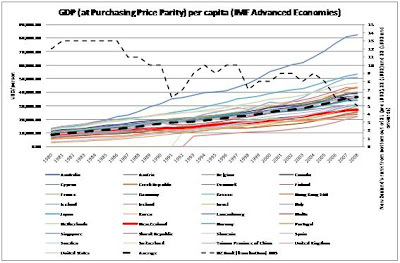 The group of countries in Figure 1 is the IMF Advanced Economies grouping rather than the OECD but the point is still obvious. New Zealand was close to average in 1980 and was ranked just below the middle of the group but has steadily dropped to well below average and now only beats four advanced economies (the Czech Republic, Malta, Portugal and the Slovak Republic). In my desire to try to find the ‘truth’ about New Zealand’s decline from the facts I discovered what is intuitively obvious, that the issue is complicated. Ultimately the truth of such a matter will only be found by examining the matter in full daylight and with the opportunity of many minds to contribute. The contribution of many minds doesn’t necessarily discover the truth, this occurs every day in most newspaper’s websites and other blogs, and seems to mostly yield a complex picture of emotions rather than much in the way of evidentiary fact. Therefore my desire is to try to distil the emotion away from the debate and establish instead intellectual principles underscored by evidence. A wiki first seemed like the best approach for such an objective, given a wiki’s principle design is around citation and sources, but a wiki is fundamentally editorial and not a debate per se. So, a blog it is, but hopefully one that is guided to rational debate and evidence. I had first hoped to start with a stunning piece of analysis that sets the ball rolling immediately but the complexity of the matter precludes this, and the data isn’t always obvious or available, so instead I am starting with what I have and am looking to continually refine the view; hopefully with the help of like minded people with something to contribute. Anyway I will outline my first theory and then we shall see how well I can defend it empirically. I start with the Fundamentals to give a foundation for the ‘building blocks’. I also start with a fundamental assumption that New Zealand is a developed economy. It may be going relatively backwards but it is developed. In the Fundamentals I reason that, ultimately in the long run, no country will be able to achieve a level of wealth greater than its available physical resources, which once fully developed only grows as a function of technology. I propose that countries can ‘punch above their weight’ but only for a limited time. Finally I point out that average individual wealth is a function of not only the numerator (the number being divided - GDP) but also the denominator (the number used to divide – population). A larger GDP divided by a larger population results in a smaller increase in GDP per capita. I then ask the question “Are we more productive?” I raise this question because my hypothesis is that growth in GDP in New Zealand is driven entirely by population driven consumption and, being fundamentally unproductive, is financed by debt. I therefore present some evidence that New Zealand’s GDP growth is funded (net) by external capital (significant direct investment but mostly debt); and once economic growth is normalised for this foreign capital then the portion of the productive economy hasn’t been growing for a very long time. This assumption follows from the principle that productive growth (in the long run) produces economic surpluses that are at least self-sustaining (ie only require short term debt at most). The third part of my hypothesis considers the Role of Population. Under the Fundamentals I raise the point that increasing population puts downward pressure on average individual wealth unless wealth is growing relatively faster. However, a growing population doesn’t necessarily explain why productivity isn’t growing well. This section also explores the components of population growth and identifies that New Zealand is able to choose the level of population growth that it experiences. The fourth section looks at the way in which countries can achieve relative advantage due to the time it takes for wealth and technology to spread across the globe. However, New Zealand doesn’t seem to have benefited from this to any great degree and raises the point “Our timing also seems to be wrong”. This section doesn’t come to any firm conclusions for why this might be the case except to consider whether this was a function of an absolutely small economy when we were relatively rich. This section also considers that we enthusiastically adopt consumer technology but don’t seem to adopt productive technology. The final section (What can we do?) starts to suggest a way forward on this complex subject. It proposes that the problem is very complex and that there are no easy fixes. The section agrees with those that claim that our current consumption is unsustainable and must, sooner or later, change. The only practical suggestion put forward is that we need more honest and robust debate on the issue and that, ultimately, there will need to be some tough decisions made. Let’s start with fundamentals and build the picture. Wealth, in the truest sense of the word, is generated when resources are developed that benefit human individuals, communities and nations. Such benefits graduate from the basics of survival (food, water, shelter, heat, health, etc) and go through the less necessary but important (communication, travel, comfort, education, etc) to the higher order wealth benefits such as (leisure, entertainment, art, culture, festival, the monumental, etc). Benefit is generated, at a cost, by the exploitation of resources which is to say by using labour to develop resources. If the benefits are greater than the effort to develop them then wealth is increased. In civilised societies (ie for the last 5,000 years) we have also enjoyed the division of labour. Greater productivity results from specialising in what we are good at and trading our surplus production for items that we are not so good at producing. In early civilisations the trade was barter but since then the system has developed money and financial systems of tradable equivalents that represent goods and services. Therefore, a modern individual, community or nation maximises its wealth by developing resources using specialised labour (focusing on what it is good at) and using capital to procure the resources it doesn’t have or the skills it does not possess where the money is generated by selling raw resources or production surpluses. In addition, and again since ancient times, financial systems have been developed that allows a portion of future earnings to be traded away (at a cost) in return for capital now (debt and/or investment) so that resources can be developed that otherwise could not. Generally the system works quite well, but not always. Finally technology plays a role as well as technology reduces the labour (ie cost) of developing resources and/or increases the benefit of those resources (eg colour TV over black and white) and also increases wealth. Therefore, over time (that is to say ignoring timing differences in trading surpluses and the dispersion of technology – which we can only ignore theoretically) the wealth of a nation is fundamentally down to the amount of resources it has property rights over and the availability of labour to develop them. For developed countries like New Zealand labour is not constrained. Populations have stabilised and immigration provides a ready source of labour. Therefore, for a developed country (still ignoring for the moment short term effects) total wealth is constrained by the resources that the country has property rights over. Many people debate this and suggest that countries can ‘punch above their weight’. This is obviously true when timing differences are taken into account but the most fundamental principles of statistics suggest that, in the long run, no normally distributed population can have a relative advantage in terms of intelligence, entrepreneurship or work ethic compared to any other normally distributed population. Although larger populations will have absolutely greater amounts of every human attribute. Timing effects can create concentrations of wealth (that can encourage non-normal population distributions) but such advantages should ‘trade away’ over time. Average individual wealth is total wealth divided by population. Therefore, a developed country with population growth that exceeds the ability of technology to allow for greater resource development over time leads to lower rates of growth of average individual wealth. Population growth in developed countries is not necessarily a good thing. Population growth can lead to increases in the total wealth as more people can consume more but consumption can be fuelled by debt, which seems to have been the case in New Zealand for many years. Debt, by definition, means spending now and paying back later. Therefore, debt fuelled consumption is not sustainable and does not mean that underlying wealth has actually increased. If the population has increased, without increasing true wealth (ie the economic development of resources), then the drain on future wealth will be even worse as the true underlying wealth is stretched even further, back to debt-holders and across a bigger base. The statistics show that New Zealand’s GDP has been growing but an economy can grow in many ways. If the growth of an economy is sustainable then it should, allowing for short term fluctuations, generate sufficient economic surpluses to substantially self fund further growth. In theory we should see that, for a sustainable economy, if we subtract the net international investment position (the net amount of capital that is brought into a country to fund growth) from GDP then we should still see growth. The extent that foreign capital is required to fund growth indicates the extent to which internal growth is not productive (ie generating economic surpluses). Preparing Figure 2 also highlighted a significant problem with assessing problems in New Zealand. The data can be very hard to find and even harder to compare. As can be seen some of the data above was not readily available and some was estimated. 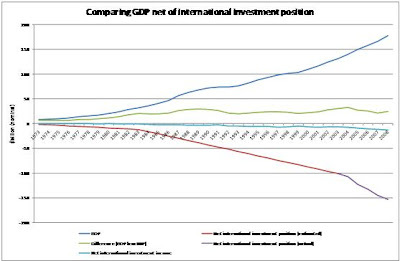 The portion of the “Net international investment position” that was estimated was done so by keeping the likely returns of the estimated curve broadly consistent with the actual data of the “Net international investment income” series and the general shape of the curve consistent with the actual data series “Net international investment income”. There is little doubt that this introduces quite a lot of error into the derived series “Difference (GDP less NIIP)”. However, the curve is credible and cannot be sufficiently in error to prevent reasonable conclusions, which are also adequately demonstrated by the actual data from 2003. Net foreign investment in New Zealand has been growing as fast as GDP, while the difference between them has been fairly constant. This suggests that all GDP growth since about 1983 has been funded by the importation of capital, mostly through debt. The difference, the suggested GDP contribution not funded by importing capital, ie generated internally, has not been growing. Our GDP appears to be coming from debt fuelled consumption. The cost of this debt the “Net international investment income” is growing steadily as well and is already significant compared to the piece of the economy that might be considered sustainable. If the assumptions and analysis of the prior two sections is correct then population growth in and of itself does not seem to be in New Zealand’s best interests. Growth seems to have come from the importation of foreign capital, which means it is likely to result from consumption spending rather production, which is then divided by an increasing population. 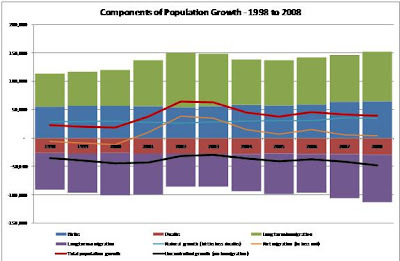 Figure 3 shows that, while natural population growth has been relatively constant, net migration has varied significantly with many more people migrating in and out of New Zealand than are dying or being born. The bold red line shows total population growth and the bold black line shows the population growth without immigration; immigration being the only component of population growth that is directly controlled by the Government. These lines show that New Zealand can have any population growth it wants from significantly negative to significantly positive. It also shows that New Zealand has chosen significant positive growth with 434,000 extra people over the eleven year period. Of this growth the uncontrolled components are 638,000 births, 306,000 deaths and 761,000 migrants leaving. Over the same period New Zealand has allowed 863,000 migrants to settle in New Zealand. The point here is that New Zealand could have selected the level of population growth that has occurred. We can make the following provisional observations. It is likely that population has increased consumption. It seems that increased consumption has been sustained by debt only. Increased population has not increased sustainable production, but has thinned out that production across a bigger base. Even the debt driven productivity that has occurred is well below the levels achieved in other advanced economies on a per capita basis. While New Zealand’s per capita GDP relativity has been dropping steadily for years, for practical purposes things don’t look so bad. New Zealand still comes near the top of the world in the quality of life standings and so the consumer surplus in New Zealand (the amount that benefits exceed costs) still seems to be very high. This is another, more measured, way of saying that New Zealand is a cheap, nice place to live. Interestingly surveys that are more focused on lifestyle don’t tend to rank New Zealand cities so high. This suggests that New Zealand is a nice but not desirable place to live, which could be a significant factor in emigration. Our problem is that population growth without an underlying increase in true wealth (economic resource development) puts downward pressure on all of New Zealand’s good attributes. The combined effect of higher populations (particularly where highly urbanised as in Auckland and Wellington) and low, and dropping, average individual wealth leads to an increasingly poor society. The colonisation of space without the underlying wealth to fund infrastructure leads to the deterioration of services, pollution and congestion; and starts to convert reducing wealth towards slums and poverty. All of which tends to lend a sensation of negative development, which is also an anecdotal element of New Zealand’s current status. For example the 2009 Mercer Quality of Living survey ranked Auckland the 4th best city in the world and Wellington 12th on a broad range of criteria which includes education, political stability, recreation, etc. So far I have ignored timing differences. It is tempting to think that the developed countries remain developed countries and that developing countries remain developing countries. But, things change. While people generally bemoan the disparity of wealth between nations wealth does migrate. As rich nations expect better standards of living and higher wages then production moves to developing countries where labour is cheaper but productivity is reasonable. As a function of income the health, wealth and education of the developing nation increases and so does the quality of life. As skills, education and expectations increase then so do wages and production moves progressively to the next cab on the rank. Technology disperses in a similar way. The initial benefits of technology fall to those who are educated and skilled enough to develop them and who can afford to pay. As more people become educated and skilled technology develops over a more dispersed area. More people can afford the technology and so it disperses faster. Eventually, without any other influences, labour, wealth and technology will equalise across the world and relative wealth will be entirely down to the resources that a nation controls and can protect. This will, however, take many generations yet, plus there are other influences at work (such as protectionist political policies, ‘diplomacy’ and war). In the meantime, a nation can benefit from this timing difference. Very rich countries such as the USA and the UK have been able to leverage these timing differences very effectively. The huge financial surpluses built by these two nations have allowed them to dominate global financial systems. Most other Western European countries have also had a share of this to some extent. They have had initial advantages in technology too. With the concentration of wealth and education comes concentration of technological development. Gradually this spreads out across the world. Since the Industrial Revolution it has already spread from England to Western Europe to the US and North America to Japan and increasingly South-East Asia. There can be significant advantages to utilising the early adopter opportunity. Arguably New Zealand had the opportunity to use economic surpluses to leverage a bigger economy but New Zealand never seemed to take advantage of its wealth; neither does Australia for that matter (despite its natural resources). New Zealand was very wealthy in the 1950s. Admittedly this was driven by primary produce (with little value add) but then again the wealth was spread across a fairly small population. Perhaps it was the size of the population and the therefore small absolute volume of wealth in world terms that made it difficult for New Zealand to capitalise on its surpluses, but our economy never diversified or expanded to any significant degree. Technology has played a greater role with our primary produce now including significant value-add. New Zealanders also tend to be early adopters of technology but this seems to be concentrated around consumer goods. By comparison our take up of automation seems to be poor with most people working harder to achieve performance well below other developed economies. New Zealand is a developed country. Real underlying wealth is only increasing through the productivity increases from technology. New Zealand doesn’t have significant natural resources in the world context. New Zealand has moderate economic growth year on year, which seems to be driven primarily through the extra consumption of population growth and seems to be financed substantially by debt. On a per capita basis New Zealand is getting steadily poorer in relative world terms. New Zealand’s growth is sustained by immigration, which is offsetting high emigration. New Zealand compares well to the rest of the world in educational quality and achievement, but this still doesn’t seem to translate into any concentration of entrepreneurial or technological excellence (in fact New Zealand seems to be below average in this regard). In the interests of brevity I haven’t included any data on this feature of our economy but reference to Chapter 1 of “From Wool to Weta” by Paul Callaghan will demonstrate some of these problems. New Zealand doesn’t have a strong financial position and actually has a very poor balance of payments, which seems to be driven by debt and the export of dividends to foreign nationals. New Zealand’s balance of imports and exports (goods and services) is not particularly bad and would be quite favourable if consumption were reduced, which would also reduce debt. Prima facie New Zealand seems to be starting to face the problems that might be expected with a growing population and no real growth in underlying wealth. It seems clear that New Zealand is getting poorer in real terms. We work very hard to achieve relatively little. Even middle class families are under financial burden and our rich seem only moderately rich on the world scene. More objectively we are struggling to afford even average levels of infrastructure investment for a developed economy. By developed I mean that the application of labour will not yield any significant extra economic development of resources. On occasion in recent years New Zealand has seemed to be labour constrained but this appears to have been in the context of debt fuelled growth through population and consumption growth. Who knows? There are many points of view on this, of course. There are also many who would claim to know why we have a problem and who caused it. The truth is, however, that this has been a problem that has been developing for a very long time. To the extent that Figure 2 can be read accurately it would seem that the economy has been stagnant for 25 years, while Figure 1 would suggest that the rot started in 1987 (although I suspect that a longer data sequence would show a longer trend of deterioration). One could argue that it was the result of Muldoon’s National Government’s ‘Think Big’ strategy. Another argument could say that ‘Think Big’ was working and it was Lange’s Labour Government that did the damage. Another point of view could say that we never recovered from the 1987 stock market crash. Against all these arguments is that these events were many years ago, with many different governments and political philosophies since then. There must be something more fundamentally wrong! For my part I think the problem is comparatively simple. We don’t have any more economic resources to develop! Adjusting New Zealand to a level of equilibrium where productivity pays for consumption at relatively good levels of average wealth is not going to be easy. For a start we’re not sure what the problem is and we’re already beholden to a significant amount of foreign call on our capital. One thing is sure, this is a complex problem and the solution will be complex. We can be sure that there will be a solution though. The current situation is unsustainable and will change eventually. The question will become how much pain will we suffer? For my part I think halting population growth (through reduced immigration) would be a start. We could reduce population by this method as well but we might find that the foreign investment position doesn’t unwind, which would make things worse. Beyond that I think we need to better understand the problem, which is going to require a far better understanding of the fundamentals than we seem to have; and, to be frank, perhaps a little more honesty in our public debate as well. Ultimately solving the problem is going to require some real political courage. Maybe we really are in trouble.